Unless you plan on growing a full-length beard, shaving is an important, daily part of most men’s morning routine. Although it can bring some displeasure, proper shaving provides protection and exfoliates your face. As with any product, there are tonnes of versions on the market and not every shaver is right for every man. If you are a first-time shave, then making the right choice of shaver will be critical for you. The following guide will ensure that your shopping trip is both well informed and satisfied. Without a doubt, the act of shaving has been around for centuries. It is even believed that in 4 B.C, Alexander the Great ordered his army to shave their beards to dissuade the enemy from grabbing their beards. It wasn’t until 1847 that William Henson invented a handheld razor in a hoe shape; this is what almost all men still use today because it is the most efficient shape and size for safe shaving. 40 years later, a salesman named King Camp Gillette revolutionized the idea of a disposable, multi-blade razor. Besides safety and quality, little has changed in the original design; however, one thing that has been added to the market is the electric shaver which are becoming the tool of choice for men these days. 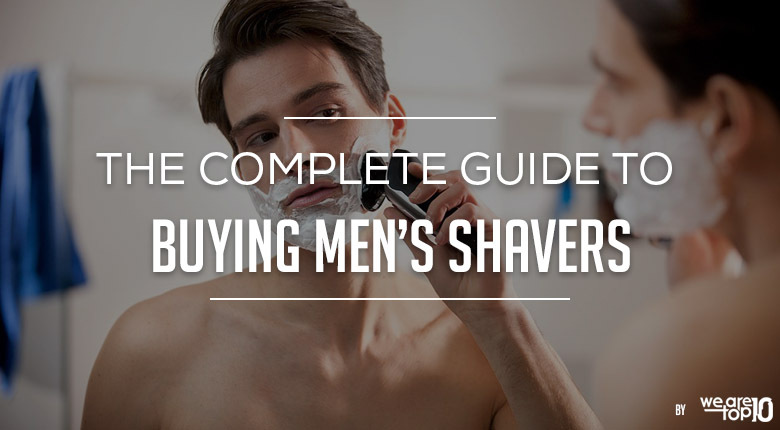 This guide will help you decide what features to look for and when buying a shaver as there are different types of shavers out there with several features that should be considered. Although not often considered, the number of cuts per minute your electric shaver is capable of completing is incredibly important. Not only could it save you time in the morning, but you will also achieve a much cleaner cut with a high-powered device. Top of the line models will offer upwards of 9,000-14,000 micro vibrations or cuts per minute that ensure your clean-shaven face is ultra-smooth. Lower numbers are also suitable, but the cuts may not be that fine. Most high-tech electric shavers will have a battery life of between 45 minutes to just less than two hours. Since it won’t take anywhere near this amount of time to complete a shave, what is more, important is how long that battery will last, and if the battery life stays consistent. A battery that is not replaceable and begins to lose power after a few months is not a great investment and should be avoided.Hopefully, the existence of a charging dock will alleviate these worries, but be careful when purchasing a cheaper model; they are not known for their longevity. When deciding between an electric and conventional shaver, it is important to determine whether or not you have adequate counter space for the charging dock. While most people will, it may not be preferable to have a bulky and not so convenient charging station next to the sink, so be sure to consider this factor when shopping. With the introduction of extremely high quality, state-of-the-art electric shavers, the wet vs. dry argument is becoming a thing of the past. Wet shaving is more refreshing, and may seem safer, but in reality, using a powerful electric shaver is quicker, better for sensitive skin, and will result in fewer cuts. Another benefit to a dry-shave is the lower incidence of ingrown hairs regardless of the direction in which you shave. If you’re worried about razor burn, make sure to use a pre and aftershave product to moisturize your skin and open your pores. A good scrub will also help make sure the razor will glide smoothly. Depending on your ideal characteristics, you may want to take into consideration the display of an electric shaver. Many newer versions offer LED displays that are easy to see and will include features such as shave time, battery life, and speed setting. If this is an important quality for you, make sure you do some research before buying and see what the display will show. Along with dry use, some cordless electric shavers can be utilized with shaving foam or gel. The underlying reasoning is that you get the best from both options- dry and wet shaving. Some electric shavers may also be used in the shower allowing you to get more from one shave. However, ensure you read the instructions carefully before using the shaver in the shower. Pivoting heads: Adjusts to your neck and face curves for an easy shave. Beard trimmer: Allow you to style the sideburns, beard, and mustache. It is attached to the shaver head back. Travel case: This is especially handy when traveling. Sparse or Fine Hair: If your skin is not sensitive and have a relatively light growth of beard, then the best option will be a single foil shaver. Medium hair: If you get skin irritation while using an electric shaver, the best-suited Shaver will be the dual foil shaver. The name “foil” comes from a thin layer of metal that envelope the top blades. Foil shavers are characterized by their straight rows of blades and are known for their precise trimming power. The blades oscillate and instead of actually cutting the hair, they lift the hairs from the face, but due to speed, this is not felt nor is it painful. Best for fine, straight hair. Offers a closer shave than a rotary blade. You have several options to choose from: single for slow beard growth or fine hair; dual for sensitive skin or coarse growth; and triple for longer stubble or hairs that are flat-lying under the lips or on the neck. Need to be well maintained and cleaned often. Can have an uneven cutting of rough or coarse hair. Rotary shavers are easily recognizable due to their unique three circular blades that cover the top. They are specifically designed to follow the curves of any face, and their unique design helps with this contouring. The blades work by rotating incredibly fast and are best for men that don’t shave every day, or those with longer, thicker hair growth. The circular motion of the blades guarantees a close shave. Extremely comfortable as hair is not pulled, but cut. Able to be used on hard to reach areas or places with sharp angles/curves. Can be used effectively on thick hair. The head of the shaver is rigid and fixed in position. This makes it harder to maneuver. You will want to avoid cheap rotary shavers as the blades could break down and lead to painful shaves or cuts. Cleaning the blades is a bit difficult. Some high-end shavers are purchased complete with a cleaning station such that they are capable of cleaning themselves. All you need to do is to pop the shaver into the base unit and then wait. It provides a convenient and easy way of keeping your shaver fuzz free and clean. All you are required to do is to fill up the cleaning fluid. You will also need to replace the cleaning cartridges often. Refills can be purchased online or from large chemists and will cost between 6$ and 12$ for a one month’s supply. What is the best product to use with my shaver? There is a multitude of soaps, foams, creams, and gels available for purchase, but you should choose your ideal lubricant based on skin type, price, and clean-up. Soaps are the most traditional but may take more time to lather and will provide less cushion than foam or cream. Foam is by far the easiest to apply and remove, can moisturize the skin, and provides the most protection against cuts and scrapes. Gels are another great option, and if your skin is extra dry, try adding a vegetable or essential oil underneath your primary product. What is the best direction to shave in? It is best to shave in the direction of beard growth starting with the sides, followed by the upper lip area, and finishing at the chin. Although you can achieve a closer shave by going against the grain, it is much easier to cut yourself, and you risk cutting a hair below the surface of the skin. This is not only painful but often results in ingrown hairs and possible infection. What are the benefits of using aftershave? Although aftershave is a personal preference, it is recommended to prevent acne, maintain clean pores, and calm irritated skin. It also comes in a variety of scents, but make sure to choose a mild version to guarantee the product is focused on protection rather than the donor. Should my shaver have a warranty? If you decide on an electric shaver, make sure the manufacturer or store offers a money-back guarantee or two-year warranty. Because electronics can and will break, it is important to cover all of your bases (especially since quality shavers will cost a few hundred dollars). You should also determine what is included in that warranty— if blades and foils are excluded, you will need to factor those replacements into the total cost of the shaver. According to a few studies, the average cartridge razor will cost at least $110 per year depending on the number of blades you will use and the company you buy from. The best cost-effective electric shavers cost around $200-250 and you may need to add $50 for replacement blades and foils. Yes, electric shavers will outlive their disposable counterparts, but it is important to weigh the benefits and detriments of each before making a decision. But, the efficiency and safety provided by electric shavers may just make their higher cost worth it. Do I need a shaving brush? Although not vital, there is a reason most barbers have shaving brushes on hand. They not only help lift the hairs to facilitate a close shave but brushes also work much better than fingers when trying to lather a soap or cream. Another less known benefit is their ability to remove dead skin cells by exfoliation. The best shaving brushes have stiff yet comfortable bristles and an easy to grip handle. Which shaver should I use: Foil or Rotary? It boils down to what you prefer, your beard growth and the type of skin that you have, whether sensitive or not. If you have a skin that dries easily or one that is easily irritated, you may want to try the foil shaver as it is less harsh on the skin. The rotary shaver is best suited for skin types that are regular or tough. You may find that you want to use both the foil and rotary shavers. Some men use one on their face and the other on their neck.